The continuous innovation of the compressed air tools and machineries, the evolution of specific productive processes and uses, require exclusively air without oil. It is easier and less hazardous to produce non-lubricated compressed air than to de-oil the compressed air contaminated by oilusing more or less complicated filter assemblies. Ceccato Aria Compressa S.p.A., always sensitive to themarket needs, in order to answer these needs, offersthe series "ECOLIFE". A new compressor with innovative features, reliable,compact, noiseless and capable of producingcompressed air without oil. 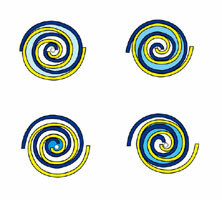 A double spiral without contact among the parts for aninnovative NON-lubricated compressor. Compact and noiseless, it does not require special installation operation, it is enough to connect it to the power supply network and to the air distribution network. The overall height dimensions allow to place the compressor even under the usual working surfaces. The condensate does not contain oil. the compression without addition of lubricating greases and oils. The absence of lubricants in the compression chamber allows to obtain delivery compressed air without oil. therefore quite constant improving the stability of the production process. 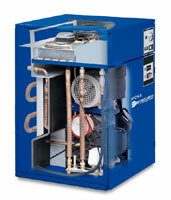 A simple compressor designed to offer the maximum duration reliability in time. An easy access to the internal components makes anymaintenance intervention easier. Thanks to its innovative system, the compressor ECOLIFE is extremely noiseless under any operation condition. Therefore it can be installed alsoclose to working places. The compression from the atmospheric pressure to the final pressure occurs gradually and without contact among the moving metallic parts in a progressive and continuous waythrough the combined action of the fixed helicoidal element equipped with a second spinning element. 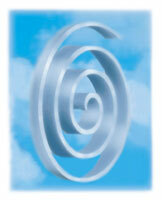 The continuous repetition of this process allows to have at the delivery compressed air with a continuous flow. ООО "Айр Энерджи" - авторизованный дилер компании Ceccato Aria Compressa S.p.A.